Aim The aim of this study was to determine the early ophthalmic and electrophysiological features of Joubert syndrome (JS) in young Egyptian children and compare them with other studies. Patients and methods A prospective study was conducted of 10 children who initially presented with neurologic deficits and diagnosed clinically, with radiologic confirmation and secondary molecular diagnostic testing. A comprehensive paediatric, neurologic and ophthalmic evaluation was performed, including visual electrophysiology and ocular examination in conjunction with confirmed determination of probable and known causative variants in Joubert-associated genes. Structural and functional deficits were observed among the individuals within the cohort and compared with reported frequencies of these defects in prior reports. Results Patients’ ages ranged from 14 months to 4 years. Known causative mutations were found in eight of them and five (genes) with confirmation of separate alleles by parental testing. In two cases, molecular confirmation of the diagnosis was not obtained. The spectrum of observed abnormalities includes epicanthic folds, hypertelorism, ptosis, nystagmus, strabismus, lid retraction and chorioretinal degeneration. 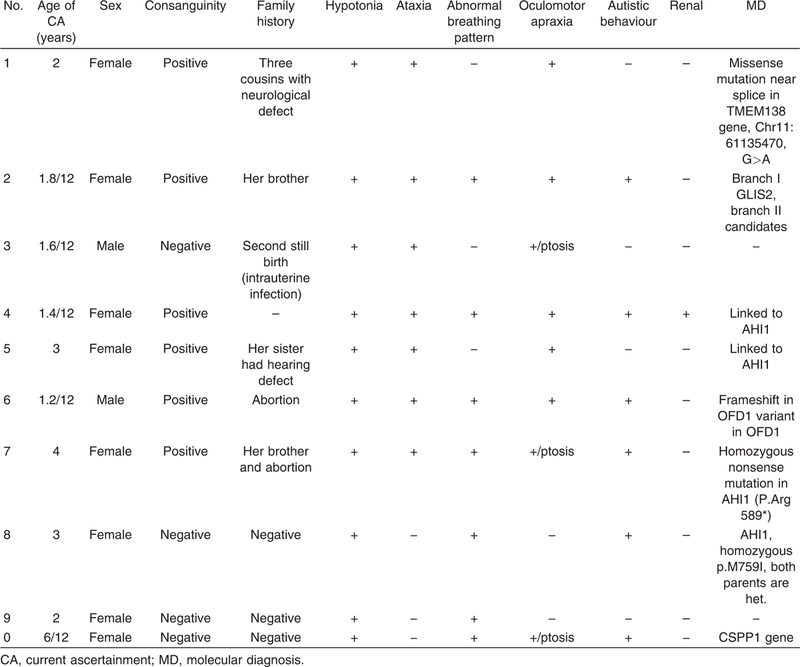 There were also delayed flash visual evoked potential (VEP) in all 10 cases. The electroretinogram responses (both scotopic and photopic responses) were greatly varied from normal to severely reduced responses, which have been previously reported. These abnormalities allow for subcategorization of the JS, which may correlate with the observed mutations. Conclusion Association of these findings with an expanded clinical definition of Joubert is warranted. The clinical subtypes of JS may be associated with specific types of mutations in the causative genes. This report, which evaluates the findings in a relatively young cohort, provides a unique opportunity to consider the earliest manifestations of JS that may lead to early recognition and appropriate genetic testing to confirm the diagnosis. Clinical findings beyond those identified in this report and by prior publications should be evaluated as potentially independent of the primary genetic condition rather than assuming that each new finding is part of the same syndrome. Joubert syndrome and related disorders (JSRD) are a group of developmental delay/multiple congenital anomalies syndromes in which the obligatory hallmark is the molar tooth sign (MTS), a complex midbrain–hindbrain malformation visible on brain imaging . It is inherited as an autosomal recessive pattern, although X-linked inheritance should also be considered . The estimated frequency of Joubert syndrome (JS) in the USA is around 1 : 100 000 . Parisi et al. found that classic JS is characterized by three primary findings: a distinctive cerebellar and brain stem malformation called the molar tooth sign, hypotonia and developmental delays. Often episodic tachypnoea or apnoea and/or atypical eye movements accompany these findings. These may be associated with multiorgan involvement, with both interfamilial and intrafamilial variability. Brancati et al. classified JS into six subgroups based on the main organ(s) involvement and the established genotype–phenotype correlates: pure JS, JS with ocular defect, JS with renal defect, JS with oculorenal defects, JS with hepatic defect and JS with orofaciodigital defects. Ocular and oculomotor involvement is common in JS. However, findings differ considerably because of a wide range of phenotypic variability among patients with JS ,. The diagnosis of JSRD is based on the presence of characteristic clinical features and MRI. To date, 27 genes have been found mutated in JS, of which 13 also cause Meckel syndrome, a lethal ciliopathy with kidney, liver and skeletal involvement . Molecular genetic testing is clinically available for most of the known genes . Optimal management requires a multidisciplinary approach, with particular attention to respiratory and feeding problems in neonates and infants. Cognitive and behavioural assessments are also recommended to provide young patients with adequate neuropsychological support and rehabilitation. After the first months of life, global prognosis varies considerably among JSRD subgroups, depending on the extent and severity of organ involvement . The aim of this work was to detect the early ophthalmic and electrophysiological features of JS in young Egyptian children and to compare them with other studies. The present study included 10 (eight female and two male) patients with JS diagnosed in the National Research Centre and referred to the Research Institute of Ophthalmology; their ages ranged from 14 months to 4 years. All patients had complete personal and family history with family pedigree analysis, complete clinical examination and ophthalmic evaluation. Patients were identified clinically and confirmed radiologically by MTS in brain ([Figure 1]). Moreover, patient’s families passed molecular studies, which were conducted through previous collaborative work by one of our authors (J.G.G.). This study was performed according to the Helsinki Declaration and was approved by the Ethical Research Committee of National Research Centre. Informed consent was obtained from parents before examination. 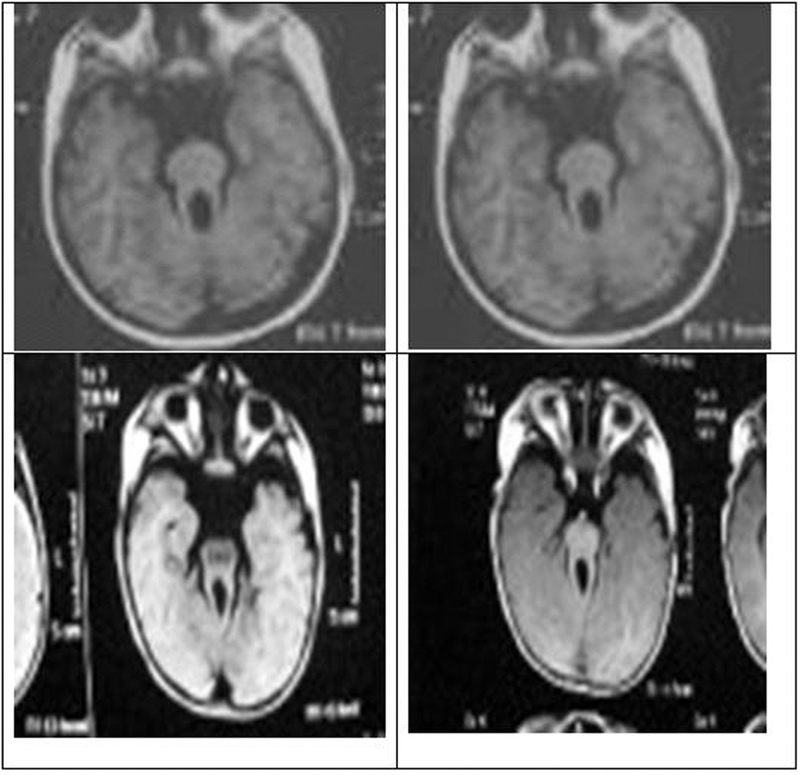 Figure 1 MRI of some patients showing the characteristic molar tooth sign (MTS) in brain. All patients were inspected for abnormal facial appearance or apparent abnormal eye deviation or oscillation of the eyes. The conjunctiva, cornea, sclera, pupil, iris and lens are examined using pen torch. For patients with manifest strabismus, the Hirchberg test was used to estimate the angle of deviation. A pen torch was shone into the eye from arm’s length, which draws the attention of the patient to fixate on the light. The corneal reflection of light was centred on the pupil of the fixating eye and decentred in the squinting eye in a direction opposite to that of the deviation. The distance of the corneal light reflex from the centre of the pupil is noted. Each millimeter of deviation is approximately equal to 7°. Examination of ocular movement included assessment of smooth pursuit and saccadic movement. Versions toward the eight eccentric positions of gaze era tested by drawing the attention of the patient to follow a pen torch. Duction is assessed if reduced ocular motility is noted in either or both eyes. A pen torch is used with careful attention to the corneal reflex. The fellow eye is occluded and the patient attention is drawn to follow the torch in the eight positions of gaze. Cover test is used to detect heterotropia; the patient fixes straight his gaze ahead of the target, which is the pen torch. If right deviation is detected, the left fixing eye is covered and note any movement of the right eye to take up fixation is noted. Uncover test is used to detect heterophoria; the patient fixates straight ahead distant target, and then covers the left eye and after 2–3 s the cover is removed. No movement indicates orthophoria. Visual acuity is assessed qualitatively in preverbal children using fixation and following method using pen torch to indicate whether the infant is visually alert or not. Comparison between the behaviour of the two eyes is done to reveal whether there is a unilateral preference. Occlusion of one eye if strongly objected indicated poorer acuity in the other eye. In verbal children who cannot respond to visual acuity testing, cycloplegic refraction was done. Dilated fundoscopy was done using indirect ophthalmoscope. For pupillary dilatation, cyclopentolate 1% eye drops were used. One drop in each eye repeated after 5 min causes maximal cycloplegia after 30 min. One drop of topical anaesthetic penoxinate before instillation of cyclopentolate is used to prevent ocular irritation and reflex tearing, thus affording better retention of cyclopentolate in the conjunctival sac. Most patients were sedated using chloral hydrate syrup; the dose was calculated according to the body weight. For electroretinogram (ERG) recording, the pupils were fully dilated using cyclopentolate eye drops 1%. One drop was applied three times every 10 min in each eye. The ISCEV standard specifies five responses: scotopic 0.01 ERG (rod response), scotopic 3.0 ERG (combined rod-cone response), scotopic 3.0 oscillatory potentials, photopic 3.0 ERG (cone response) and photopic 3.0 flicker were performed using the Reticom system (Roland Consult). The active (HK) electrode was placed in the lower fornix. The reference electrode was placed near the outer canthus, with the electrode placed on the forehead serving as ground electrode. A Ganzfeld stimulus was produced by a mini-Ganzfeld stimulator, which was positioned close to the eye and testing each separately. It was recorded according to the ISCEV standard. The active electrode is placed on the scalp over the visual cortex at Oz. An electrode at Fz served as the common reference. The ground electrode was placed behind the right ear. Patients’ ages ranged from 14 months to 4 years. Positive consanguinity was noticed in 6/10 (60%) and positive family history of similar condition was reported in 2/10 (20%). Abnormal head position was present in three patients (two had head tilt and one had head nodding). Three patients had pendular nystagmus (one with head tilt to the left, the second with head nodding and the third with normal head position). Bilateral ptosis was diagnosed in three patients, epicanthal folds in three patients, esotropia in two and exotropia in one patient, and hypertelorism in another two patients; finally, lid retraction was noted in only one patient. Eye examination revealed iris coloboma in one child, and chorioretinal degeneration in 6/10 patients. Pupilomotor test revealed round regular reactive pupil in all cases, with narrow pupil in one patient. Intraocular muscle motility revealed normal muscle balance in 8/10 patients and inferior oblique muscle over action in 2/10 patients. The VEP and ERG results are summarized in [Table 3]. 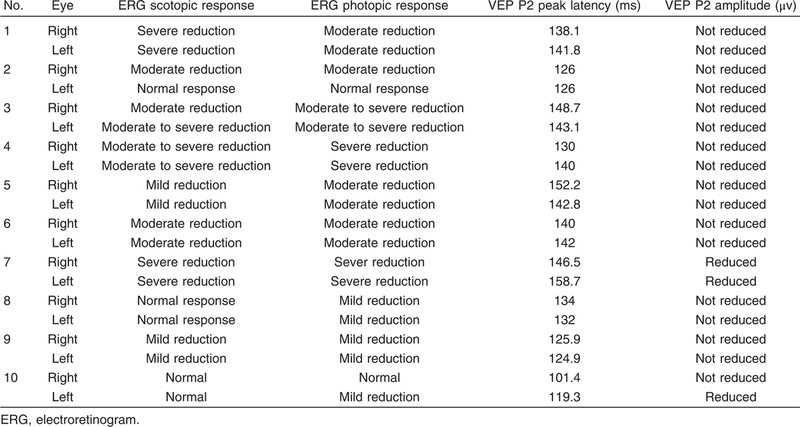 Transient flash VEP recording was delayed in all cases; P2 peak latency ranged from mild delay to very severe delay (124.9–170 ms); only one case showed normal P2 latency in one eye. In three of 10 cases, P2 amplitude was attenuated. The ERG responses (both scotopic and photopic responses) were greatly varied from normal to severely reduced responses. In the same patient interocular amplitude reduction differences were observed for scotopic and photopic responses. In one of 10, the ERG responses were within normal range in both eyes. Another case showed severely attenuated wave amplitude in all ERG responses in both eyes. In 4/10, the ERG changes were from mild to moderate reduction in scotopic and/or photopic responses. Four of 10 showed moderate to severe reduction in either scotopic or photopic responses ([Table 1],[Table 2],[Table 3]). Three patients represented with nystagmus, while the other seven patients represented with delayed milestones. The neurological presentation of JS includes hypotonia, developmental delay, abnormal eye movements and neonatal breathing abnormalities as it has been described by Valente et al. . Eye manifestations of our patients were consistent with previous studies . Ptosis has been reported with JS . Nystagmus, neovasculization and pigmentary retinal dystrophy have also been reported with JS ,. Unusual eye movements, pendular horizontal nystagmus more pronounced on left gaze was reported by Gill et al. . Eye examination for nine patients with JS was done by Schild et al. All patients had abnormalities in ocular motility. Head thrust on left gaze was found in 4/9 of patients, nystagmus and strabismus were detected in 8/9 patients, chorioretinal coloboma in 5/9, retinopathy in 3/9, congenital ptosis in 2/9 and facial nerve paresis in one patient. In the present study, full-field ERG was done on 10 patients; the ERG picture was greatly varied from normal to severely reduced responses. These were consistent with previous studies that reported that retinal abnormalities occurred in a subgroup of patients carrying the diagnosis of JS ,. Out of 10 patients, four cases represented with a mild to moderate ERG deficit; the fundus picture was normal or tigroid. The more severely reduced photopic and scotopic ERG responses were found in 5/10 patients; their fundus picture showed salt and pepper appearance or chorioretinal degeneration. Our findings support the study of Hodgkins et al. , who performed visual electrophysiology in 18 patients. ERG was found to be abnormal in 14 of them. Among the four normal recordings were those from the youngest patients in their study, and one of them had evidence of deterioration although still in the normal range. They found evidence of progressive retinal damage in six other patients with longer follow-up. Schild et al. found that 3/9 patients who met the diagnostic criteria of JS had a retinopathy with either abnormal ERG and/or normal fundus appearance with or without visual impairment. Chorioretinal colobomata were present in 5/9 cases. In the present study, the flash visual evoked potential (fVEP) was delayed in almost all cases and was varied from mild to very severe delay. The fVEP delay means conduction delay of signal transmission along the retinocortical pathway. In cases with severe retinal dysfunction (with severely attenuated ERG picture), their fVEP recordings were markedly delayed and thus the conduction delay could be reasoned by retinopathy. In 2/10 cases, the fundus is normal and electroretinographic picture was normal or showed mild changes, even though their fVEP P2 wave was delayed. These finding suggested that fVEP changes in JS could be related to central factor beyond the retina. Delayed fVEP in cases with no nystagmous was also found. This suggested that the delayed fVEP coud be a part of maldevelopment such as delayed myelination . Khan et al. conducted their study on eight patients with JS aged from 7 months to 10 years. The electroretinography findings were normal in all patients. Most patients (5/8) had primary-position nystagmus (see-saw in 3/5). The fVEPs were abnormal (asymmetric) in 6/7 examined patients. They suggested abnormality in optic nerve decussation in patients with JS. Optic disc drusen had been described in three adolescent patients and an infant with JS . Molecular study of eight patients revealed mutations linked to, or in, the AH1gene in four patients − three of them with chorioretinal degeneration. Sturm et al. reported the phenotype correlations between AHI1 mutations and retinal involvement. Westfall et al. reported that AHI1 is required for the maintenance of photoreceptor outer segments, as it ensures that there is proper preservation of polarized vesicular trafficking to the cilia. When AHI1 is absent in the mouse model, retinal degeneration occurs. In addition, Watson et al. reported TMEM 138 mutation in one patient and OFD1 mutation was found in another. OFD1 mutations were usually reported in ciliopathies; this spectrum includes OFD1 syndrome, SGBS2 and JS. . One patient with CSPP1 mutation was also detected. Mutations in CSPP1 lead to Classical JS as it has been described by Naiara et al. . GLIS2 mutation was found in one patient; this mutation was previously reported in patients with JS . The early neuro-ophthalmological findings in JS are not pathognomonic, but may lead to the diagnosis of JS. The syndrome should be suspected in patients with nystagmus, especially see-saw nystagmus, and abnormal OKN and/or OMA, and/or colobomata of the fundus. Irfanullah , Khan S, Ullah I, Nasir A, Meijer CA, Laurense-Bik M et al. Hypomorphic MKS1 mutation in a Pakistani family with mild Joubert syndrome and atypical features: expanding the phenotypic spectrum of MKS1-related ciliopathies. Am J Med Genet A 2016; 170:3289–3293. Wang L, Yang Y, Song J, Mao L, Wei X, Sun Y et al. Two novel mutations in the C-terminal region of centrosomal protein 290 (CEP290) result in classic Joubert syndrome. J Child Neurol 2014; 30:772–776. Paprocka J, Jamroz E. Joubert syndrome and related disorders. Neurol Neurochir Pol 2012; 46:379–383. Parisi M, Glass I. Joubert syndrome and related disorders. In: Pagon RA, Bird TD, Dolan CR, Stephens K, Adam MP, editors. Source gene reviews [Internet]. Seattle, WA: University of Washington, Seattle 2012. pp. 1993–2003. Brancati F, Dallapiccola B, Valente EM. Joubert syndrome and related disorders. Orphanet J Rare Dis 2010; 5:20. Sturm V, Leiba H, Menke MN, Valente EM, Poretti A, Landau K, Boltshauser E. Ophthalmological findings in Joubert syndrome. Eye (Lond) 2010; 24:222–225. Poretti A, Christen HJ, Elton LE, Baumgartner M, Korenke GC, Sukhudyan B et al. Horizontal head titubation in infants with Joubert syndrome: a new finding. Dev Med Child Neurol 2014; 56:1016–1020. Bachmann-Gagescu R, Dempsey JC, Phelps IG, O’Roak BJ, Knutzen DM, Rue TC et al. Joubert syndrome: a model for untangling recessive disorders with extreme genetic heterogeneity. J Med Genet 2015; 52:514–522. Suzuki T, Miyake N, Okamato M. Molecular genetic analysis of 30 families with Joubert syndrome. Clin Genet 2016; 90:526–535. Valente EM, Dallapiccola B, Bertini E. Joubert syndrome and related disorders. Handb Clin Neurol 2013; 113:1879–1888. Makino S, Tampo H. Ocular findings in two siblings with Joubert syndrome. 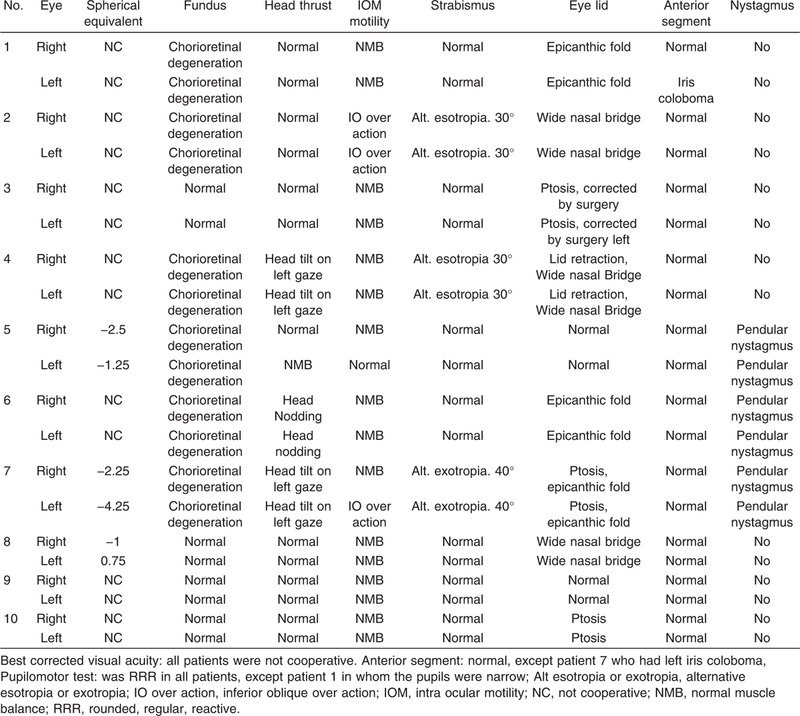 Clin Ophthalmol 2014; 8:229–233. Burt B, Levine J, Le K. Adult-onset bulbar ptosis in Joubert syndrome. Clin Ophthalmol 2012; 6:151–153. Gulkilik G, Erdenoz S, Oba EM. A case of Joubert syndrome with features of ocular neovascularization. J Pediatr Ophthalmol Strabismus 2010; 47:e1–e3. Westfall JE, Hoyt C, Liu Q, Hsiao YC, Pierce EA. Retinal degeneration and failure of photoreceptor outer segment formation in mice with targeted deletion of the Joubert syndrome gene. J Neurosci 2010; 26:8759–8768. Gill H, Muthusamy B, Atan D, Williams C, Ellis M. Joubert syndrome presenting with motor delay and oculomotor apraxia. Case Rep Pediatr 2011; 2011:262641. Schild AM, Fricke J, Herkenrath P, Bolz H, Neugebauer A. Neuro-ophthalmological and ophthalmological findings in Joubert syndrome. Klin Monbl Augenheilkd 2010; 227:786–791. Srour M, Hamdan FF, Schwartzentruber JA, Patry L, Ospina LH, Shevell MI et al. FORGE Canada Consortium. Mutations in TMEM231 cause Joubert syndrome in French Canadians. J Med Genet 2012; 49:636–641. Hodgkins PR, Harris CM, Shawkat FS, Thompson DA, Chong K, Timms C et al. Joubert syndrome: long-term follow-up. Dev Med Child Neurol 2004; 46:694–699. Gitten J, Dede D, Fennell E, Quisling R, Maria BL. Neurobehavioral development in Joubert syndrome. J Child Neurol 1998; 13:391–397. Khanet AO, Oystreck DT, Seidahmed MZ, AlDrees A, Elmalik SA, Alorainy IA, Salih MA. Ophthalmic features of Joubert syndrome. Ophthalmology 2008; 115:2286–2289. Yilmaz S, Biler ED, Solmaz AE, Serdaroglu G, Tekin HG, Gokben S. Optic disc drusen mimicking papilledema in an infant with Joubert syndrome. Genet Couns 2015; 26:35–39. Watson CM, Crinnion LA, Berry IR, Harrison SM, Lascelles C, Antanaviciute A et al. Enhanced diagnostic yield in Meckel-Gruber and Joubert syndrome through exome sequencing supplemented with split-read mapping. BMC Med Genet 2016; 17:1. Coene KL, Roepman R, Doherty D, Afroze B, Kroes HY, Letteboer SJ et al. OFD1 is mutated in X-linked Joubert syndrome and interacts with LCA5-encoded lebercilin. Am J Hum Genet 2009; 85:465–481. Naiara A, Jennifer LS, Rasim OR, Eric S, Ali GF. Mutations in CSPP1 lead to classical Joubert syndrome. Am J Hum Genet 2014; 94:80–86. Hildebrandt F. Joubert syndrome (type B) and Meckel syndrome. Nat Genet 2011; 43:189–196.